When you first taste this jar mix cheese soup, you’ll find it hard to believe that it wasn’t made with fresh grated cheese and fresh cream. 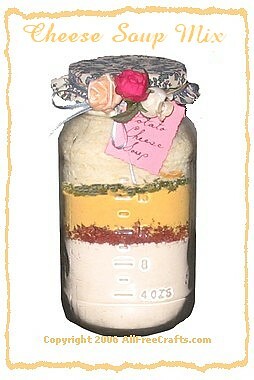 This is my own original layered jar recipe for creamy cheese soup. My daughter and I have been tweaking it over the past month to get exactly the right proportions between the cheese sauce mix and the instant potato flakes. We think the following recipe is attractive in the jar, good to look at in the serving bowl, and delicious enough to serve for company. We also found that while top quality ingredients cost us a little more, the improvement in taste and texture was worthwhile. Garnish this soup with grated cheddar cheese and/or chopped chives and serve hot with fresh bread, crackers or croutons. If you wish, you may use our free printable Cheese Soup Label (also shown below) to decorate your jar and provide preparation and serving instructions. Layer ingredients in the order given in a one quart (four cup) glass jar. Use a spoon to pack each layer in place before adding the next ingredient. Pack instant potato flakes tightly, right to the top of the jar. Secure with a screw top lid. Decorate the jar lid as desired. Print the label shown above, or write your own label, then glue the label to the jar or tie it to the jar lid with pretty ribbon or raffia. Empty Cheese Soup Mix into a soup tureen or serving bowl. Stir in 5 cups of boiling water. If soup is too thick, add another ½ cup of boiling water. Allow to stand for five minutes and stir well. Garnish with grated cheese. Broccoli Cheese Soup – Add one cup of warm, cooked, finely chopped broccoli to the soup, right after adding the boiling water. Let stand for five minutes. Garnish with grated cheddar cheese. Cauliflower Cheese Soup – Cook one cup of small cauliflower florets until tender. Add to soup, right after adding the boiling water. Garnish with grated cheese and chives. Let stand for five minutes. Ham and Cheese Soup – Heat one cup of diced ham in the microwave until warm. Add to soup directly after adding the boiling water and let stand for five minutes. Carrot and Cheese Soup – Add one cup of warm, cooked, very finely chopped carrot to the soup, directly after adding boiling water. Let stand for five minutes. Garnish with fresh chopped chives. That might be a good option. Skim powdered milk wouldn’t be as satisfying, but full cream powdered milk could be quite tasty. I’ll have to try it! That is really satisfying for me to hear. Soup in a Jar has been popular in North America for a few years now, for homemade gifts and fundraising at bazaars and things like that. I love the idea that you’re introducing this to your family and friends in South Africa. The internet is great for things like that, and sharing around the world. Thanks for letting me know!